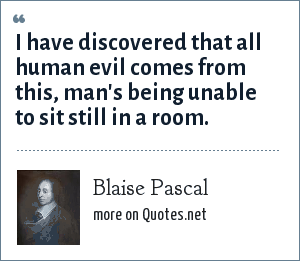 Blaise Pascal: I have discovered that all human evil comes from this, man's being unable to sit still in a room. "Blaise Pascal Quotes." Quotes.net. STANDS4 LLC, 2019. Web. 23 Apr. 2019. <https://www.quotes.net/quote/16232>.